I found a good job that I'll be starting with next week already so things will probably stay a bit slower while I get to know everyone there and my tasks and settle in. But I'm still making some progress as you can see on the left. 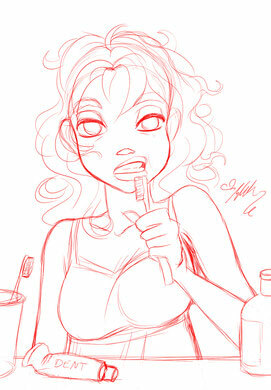 A little sketch of Irma's morning routine, brushing her teeth. Sorry for the long wait, and thanks so much for all your support and understanding! I'll post some snippets and things here to keep you entertained until I get the next page finished. 'W.i.t.c.h.' is a Disney series. I do not own any characters or other items from the original works. This is a fan comic for non-financial purposes.